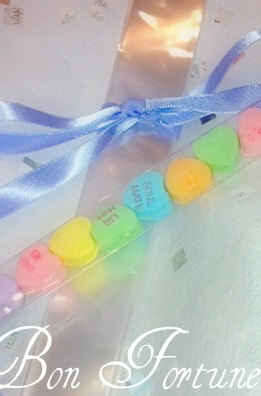 Conversation hearts are to Valentine's Day what Peeps are to Easter, or candy corn to Halloween. A quintessential treat that no one really eats. 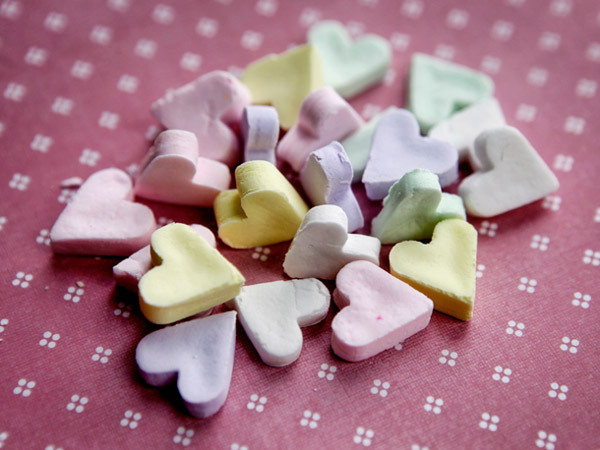 Sweet hearts are fun to look at and perhaps play with but a bit hard and tasteless. So why not make them yourself? Yes. You can. Just 4 simple ingredients plus extracts for color and taste. Flavored with banana, strawberry, wintergreen, orange essence, perhaps violette and rose essence. Flavors to match those divine colors. Now that is love. I heart Stella Parks and her recipe for these sweets available on her BraveTart.com blog here. Once you make these beauties, package them up pretty in tiny glassine bags, or eco friendly clear cellulose bags, available at Bon Fortune. Valentine treats worth talking about MADE BY U.